The Auxiliary of Mon-Vale Health Resources, Inc. will sponsor their Annual Fall Apple Festival on Friday, Sept. 29, from 11 a.m. to 4 p.m. in the Anthony M. Lombardi Education Conference Center and the outdoor Central Plaza at Monongahela Valley Hospital. The festival will feature a variety of delicious foods including roasted turkey sandwiches; pasta salad with butternut squash; autumn-style side salad with apples; dried fruit and raisins, a chili bar; apple dumplings and ice cream. Also for sale at the festival will be pizza, apple cider, churros and Amish food, as well as crafts, home baked goods, jewelry and fall decorations. Proceeds from the Auxiliary's festival are used to benefit the Hospital's patients and visitors. For more information, contact the Gift Shop at 724-258-1167. 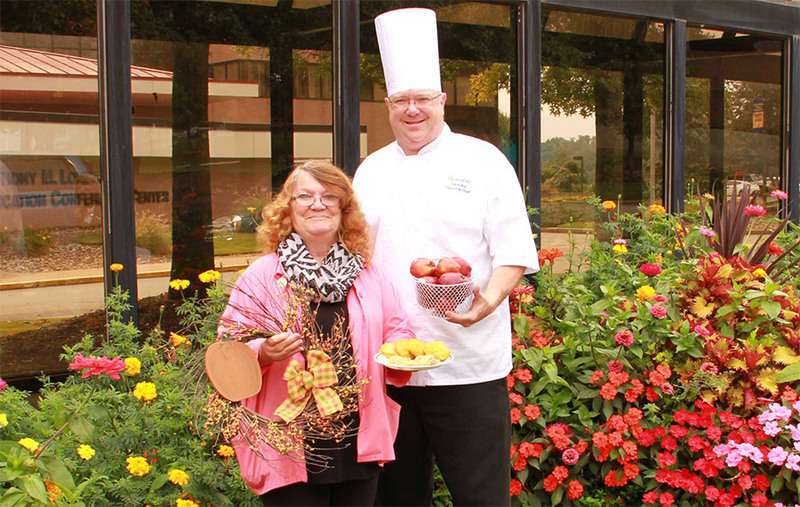 Auxiliary Ways and Means chairperson, Martha Durinsky, and executive chef, Corey Nix, prepare for the Fall Apple Festival on Sept. 29 at Monongahela Valley Hospital.